Homeopathy does not suppress symptoms. It is a natural medicine that helps lift past suppression of all types including past chemical, drug ad vaccines exposures. It assists the body in mineral rebalancing and healing of the mind, body and spirit. Homeopathy is a holistic medicine that naturally balanced the body. Homeopathy treats each person as an individual. Homeopath looks for the “totality of symptoms” – which means looking at everything about that person. This requires a careful intake of the person’s symptoms, personality, likes, dislikes, food preferences, sleep patterns as well as key emotional, physical and chemical traumas. A homeopathic remedy is then carefully researched and prescribed. In classical homeopathy, only one remedy is dosed at one time. There may be more than one potency or a remedy and more than one remedy used in cases. Many complex chronic care issues will also require the use of bowel nosodes, nosodes and/or sarcodes. Homeopathy is a complete, holistic medical system that has been used over 200 years to treat and cure a wide variety of acute, infectious and chronic illnesses. Homeopathy is considered a healing art as well as a science, and takes a tremendous amount of study and dedication to excel and master in. Homeopathy works with the whole person and is a holistic medicine that assists the body to rid itself of the disturbances that have caused illness. A qualified Classical Homeopath works with one remedy at a time, choosing the one that best matches the key presenting signs and symptoms in the person as an individual. There is no “one size fits all” remedy used for everyone even if they have the same condition to be treated. A Homeopath meets you either in person or via internet video conferencing to learn all about you. They will ask many types questions to get a clear picture of the most important things about you including your medical history, your emotional symptoms, mental symptoms, physical symptoms and any unique characteristics. They will also want to know your food likes, dislikes, what stressors are in your life and what significant past or current trauma have impacted you both physically and emotionally. Homeopathic products are classified as drugs under the Food, Drug, and Cosmetic Act (FDCA). Specific regulatory guidance for the marketing of homeopathic drugs is given in a U.S. FDA Compliance Policy Guide. Homeopathic medicines must comply with FDA labeling requirements (21 CFR §201) and be manufactured in accordance with Current Good Manufacturing Practices (21 CFR §210 and §211). Manufacturers of homeopathic products must also register with the FDA and may be subject to FDA inspections. Homeopathy works with minute, dilute and shaken substances that have been made into remedies. Once a remedy is potentized and made into a tincture, only the frequency of that diseased substance remains. This tincture is then dropped on tiny pills to make each of the remedies or nosodes, in various potencies. Once a remedy has been greatly diluted, if it were tested, not a single molecule of the original substance would be detected above a certain dilution (the 23rd). We know however, that the energy or frequency of substance used is still there. It has been diluted to remove any of the toxic effects of that substance, while maintaining the healing effects. C Scale: The most common C scale potencies used in homeopathy are: 6C, 12C, 30C, 200C, 1M (1000C), 10M (10,000C) and 50M (50,000C). LM Scale: The LM scale potencies are also used and begin with LM1 and proceed up the scale to LM2, LM3, LM4, etc. These are typically dosed daily and in water. The C potencies can be used both for dry dosing and also with water dosing. Homeopathy is based on “like cures like”. 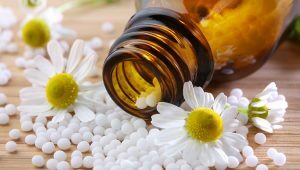 A remedy chosen for use in homeopathy on any individual would be the same one that would cause these same symptoms of disease in a healthy person. If the remedy that matches the symptoms that exist in the person, then these symptoms are cured with homeopathy. For over 200 years, people have taken homeopathic remedies in “provings” so that important and detailed data could be collected and compiled on what action the remedy produced in healthy individuals. These recorded symptoms in provings are done in a very controlled and consistent way. The symptoms collected have been historically been recorded in a comprehensive index called a materia medica and then indexed in various repertories. Homeopathy look at symptoms as a way that the body tries to heal itself. Homeopathy believes that a Vital Force or “life force” animates all living things and if it is distuned, disease or illness is the result. Anytime that symptoms are suppressed with antibiotics, anti-fungal creams, steroid creams, ointments, etc., the body is not assisted with natural healing. We call this suppression of symptoms. When the symptoms are suppressed, the imbalance is driven even deeper and more permanently into the person, and at deeper organ levels. Allopathic (western) medicine always works in this suppressive way by using surgery, antibiotics, drugs, removals of warts, polyps, growths, tumors, etc.